On November 11, 1918 amid the joyous festivities occurring in downtown Hartford to celebrate the end of the World War, Civil War veteran John Hale Thacher made his way to the top of the “old City Hall” (Old State House) to ring its bell. It was for him a repeat performance. Around 9 p.m. on Sunday, April 9, 1865, news reached Hartford of Robert E. Lee’s surrender to Ulysses S. Grant. Thousands of Hartford citizens took to the streets in celebration. The downtown was bright with bonfires, Chinese lanterns and the gas jets in store display windows blazing at full force. An impromptu procession formed and marched down Main Street to the South Green and then back again. Joining in with the noise of the crowds and bands, bells pealed including the State House bell being rung by veteran soldier John Thacher. A descendant of Revolutionary War soldier Captain John Thacher (New Haven Militia), he mustered in to Company G of the 20th Connecticut Volunteer Infantry on September 8, 1862 and saw action at Chancellorsville in May 1863 and was among the first of the Union troops to arrive at Gettysburg the following July. 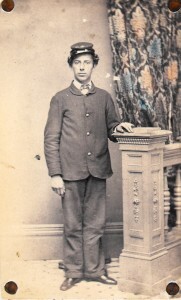 He was discharged for disability on March 20, 1864. After the war, Thacher was employed at the Connecticut Fire Insurance Company, was active in Grand Army of the Republic (including serving as commander of the Robert O. Tyler during the latter part of the 1890’s ) and was a trustee of the Soldiers’ Home in Noroton. He died at his home on Capitol Avenue on August 3, 1927 at the age of 80. The young widow Mary Shurtliff turned to running a boarding house to earn a living when her husband John died in 1852. To help support his mother, James Shurtliff went to work at James Ranney’s grocery store on American Row in Hartford. All his wages were turned over to his mother. He was no more than 12 years old. 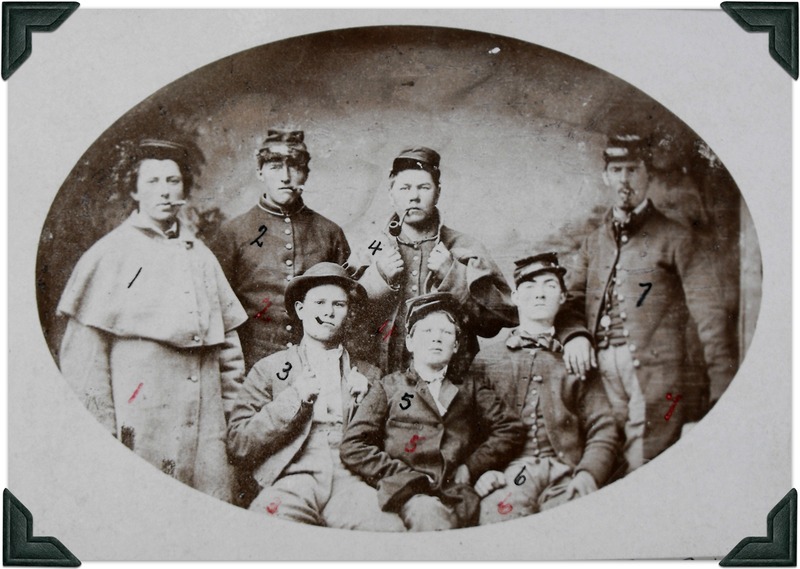 In the summer of 1862, the 18 year old Shurtliff enlisted at George Gouge’s recruiting office at 311 Main Street and joined the 16th Connecticut Volunteer Infantry. Despite the horrors of war that beset the 16th, his two years in the army were most likely the most carefree time of life. (He is included in a 1863 photograph in the Connecticut State Library archives having a lark with his comrade soldiers in Suffolk, VA). He sent home most of his soldiers’ pay to his mother, who became ill in the winter of 1862 and was no longer able to work. 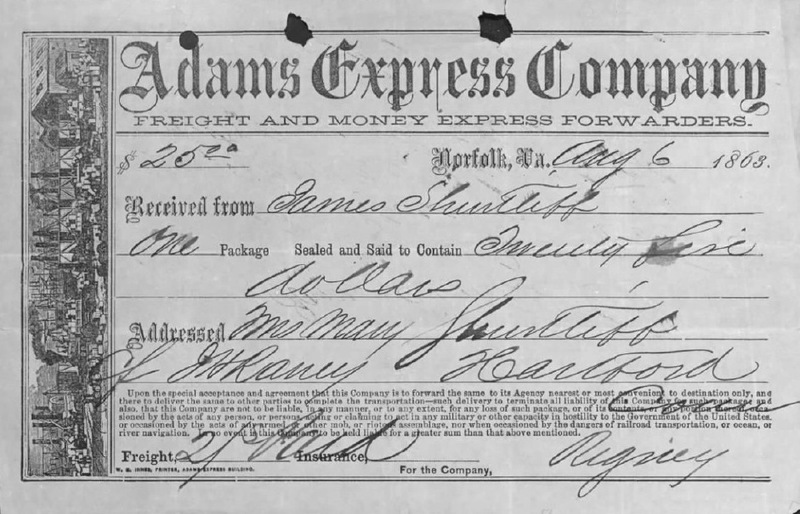 Mary Shurtliff’s circumstances became desperate in April of 1864 when James, along with most of the 16th Connecticut, was captured by the Rebel army in Plymouth, NC and sent to Andersonville prison. She would not only be left to worry and wonder about her only son’s survival but would have been in dire financial straits since army policy was to stop the wages of soldiers captured or listed as missing in action. Hartford butcher Richard Seymour, James Shurtliff’s last employer, bluntly described Mary’s situation – She is perfectly poor. After learning of her son’s death in prison in the late fall of 1864, Mary Shurtliff turned to the federal government for relief, filing an application for a mother’s pension on December 9, 1864. But without an official declaration of her son’s death, her application stalled. 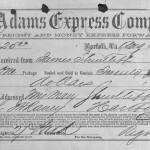 On May 9, 1866 – a year and a half after making her initial application – Mary Shurtliff was awarded an $8 a month pension (back dated to her son’s death of September 21 1864). By this time, she was living at the Widows’ Home on 1846 Main Street (across from Old North Cemetery) where she resided until her death on April 4, 1870. Mary Shurtliff was buried next to her husband John in Hartford’s Spring Grove Cemetery. 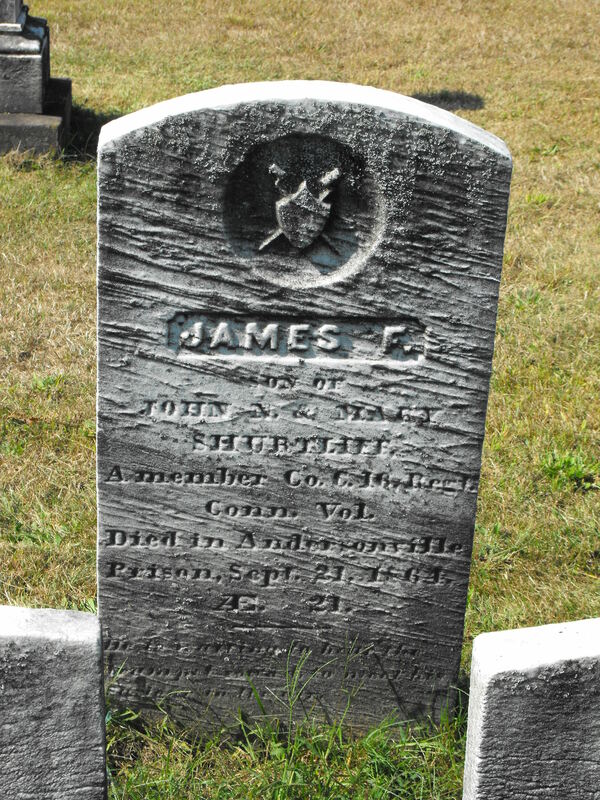 James Shurtliff is buried in Andersonville National Cemetery. An effigy stone at his parents’ gravesite commemorates his death and service to his country. 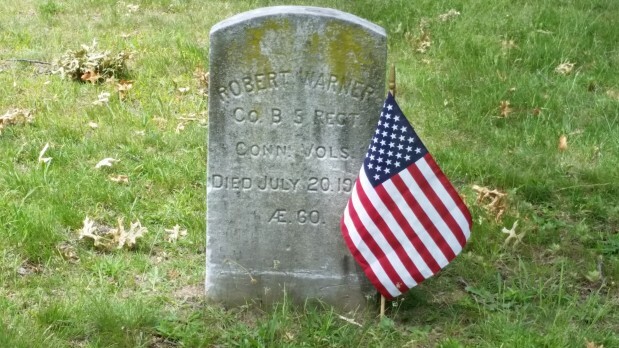 Robert Warner immigrated to the United States from Ireland as a young boy and mustered into Co. B of the 5th Connecticut Volunteers at the tender age of 17 on July 22 1861. He fought with the 5th Connecticut in some of the most memorable and grueling of the Civil War battles including Gettysburg, Chancellorsville and Cedar Mountain (and was wounded in the latter two). 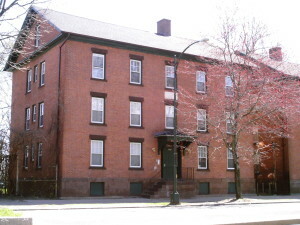 Private Warner returned to Hartford when he mustered out of the regiment in 1864 and lived and worked in Frog Hollow until his death at Fitch’s Soldier Home in Darien on July 20, 1903. Members of the Nathaniel Lyon Grand Army of the Republic Post – Commander Charles Jackson, Quartermaster Robert Pyne, Dewitt Graves and George Jones – bore their comrade to his final resting place. 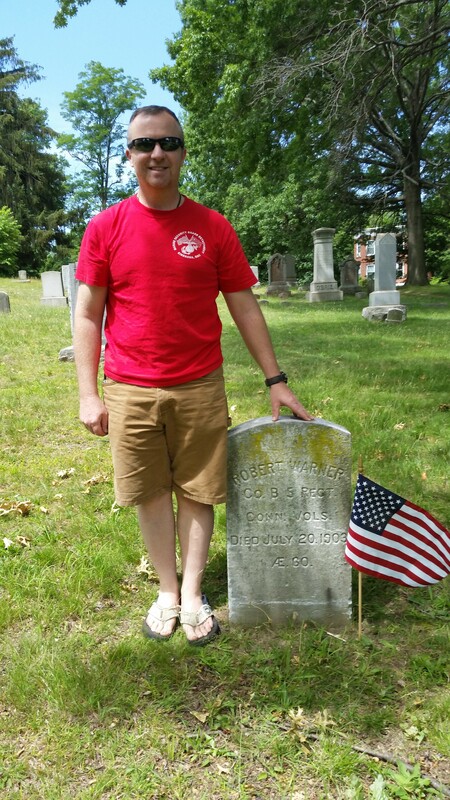 Over a century after his death, recently retired Marine Gunnery Sergeant Robert Warner contacted me – could I help him locate his great great grandfather’s gravesite? It was an honor to locate this gravesite at Zion Hill Cemetery and to receive a photo of Sgt. Warner with the Colors he placed to honor his ancestor. 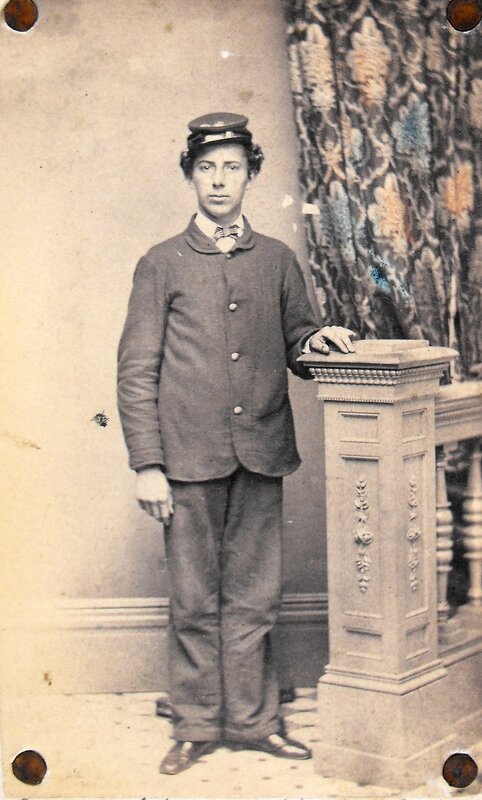 I am thrilled when descendants of Hartford’s Civil War veterans reach out to me for information on their descendants. Feel free to contact me (mfalvey1978@gmail.com) if you are looking for information about a Civil War veteran who enlisted from and/or lived and died in Hartford – I am especially interested in any photos of veterans you can share with me. Record of service of Connecticut men in the army and navy of the United States during the War of the Rebellion. 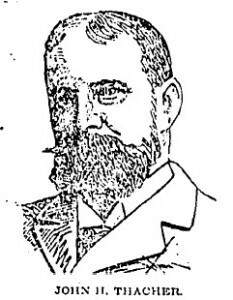 Hartford, Conn: Press of Case, Lockwood & Brainard Co., 1889. Pg. 232, 708. Robert Warner obituary. Hartford Courant. July 22, 1902. Easel ornament of the personal record of Robert Warner, dedicated to him Christmas Dec 25 ’92 by his wife Elizabeth. Photo provided to author by Gunnery Sergeant Robert Warner. This would have made a great story but . . .
Major Henry Pasco had been captured along with most of the 16th Connecticut in Plymouth, NC on April 30, 1864 and did not escape from his rebel captors until February 1865 – he could not have been in Hartford for the election. We’ll probably never know whether Lockwood had been at the scene of this election disturbance with another comrade, had heard of this disruption from someone else or totally fabricated the story. 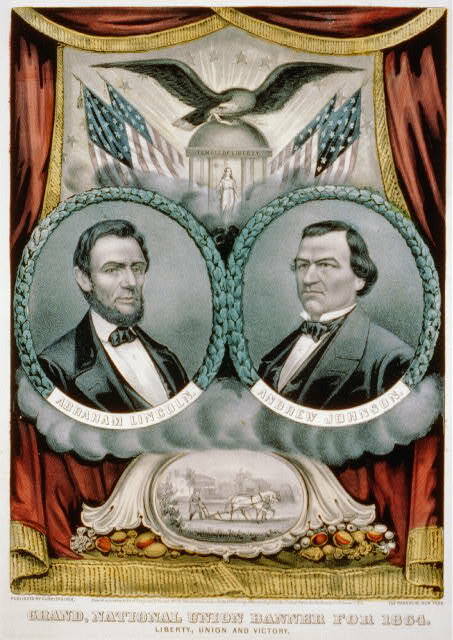 Abraham Lincoln’s winning of the electoral votes of 22 states (losing Delaware, Kentucky and McClellan’s home state of New Jersey) can be credited to Sherman’s successful summer campaign to take Atlanta and the Union victory at the battle of Cedar Creek in mid-October. And the votes of the citizen-soldiers who voted for their Commander in Chief during brief visits home or by absentee ballot played a critical role in his re-election. Human nature will not change. In any future great national trial, compared with the men of this, we shall have as weak and as strong, as silly and as wise, as bad and as good. Let us therefore study the incidents of this, as philosophy to learn wisdom from, and none of them as wrongs to be revenged.